Software Testing(Manual Testing) Resume Preparation with Career Brief, Professional Summary, Software Skills, Academic Qualification, Certifications, Project Details and Personal Information. Project Details like Project Environment, Project Description and Job Responsibilities for Software Tester Resume. Understanding Test Requirements, Deriving Test Scenarios, Test Case Documentation, Test Data Collection, Test Execution, Test Reporting and Continuous Development of Testing Skills. • Engineering Professional having about 3 Years of Software Testing Experience. 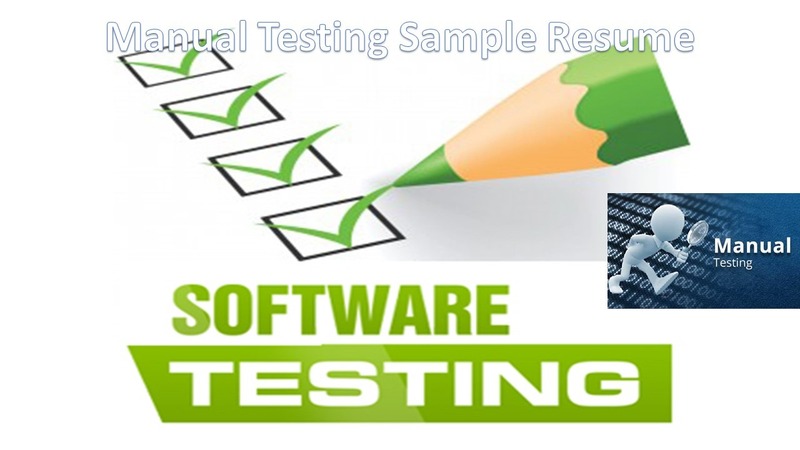 • Familiar with all phases of Software Development Life Cycle and Software Test Life Cycle. • Understanding, Analyzing and Streamlining Test Requirements. • Knowledge on different Levels of Testing (Unit Testing, Integration Testing, System Testing and Acceptance Testing). • Familiar with Functional and Non-functional Testing. • Well versed with Test Documentation (Test Scenario, Test Case, Test Data, Defect Report, and Test Metrics). • Expertise in Bug Reporting & Tracking Process, Bug Reporting and Tracking using Bug tracking tools like Bugzilla and Issue Tracker. • Knowledge on SQL to conduct Database Testing. • Familiar with Programming Fundamentals (Structured Programming and Object Oriented Programming). • Knowledge on Test Automation Tools like UFT/QTP and Selenium. • Excellent Communication, Interpersonal Skills. Quick Learner, versatile, adaptable and process -oriented with high customer orientation. • Familiar with Industry Quality Standards like ISO, CMM/CMMI and IEEE. Bachelor of Engineering (CSE) from Jawaharlal Nehru Technological University, Hyderabad, Telangana in 20**. • ISTQB Foundation Level Certification from ITB in April 20**. Digital Signature is Software that shows advertisements and information on a digital TV in Railway Stations, Bus stations, and other Public places. The user specifies the date, time, the video file, the image file and text to the software. The software shows the advertisements at the scheduled time. The Multi Banking System Interface is targeted to the future banking solution for the users who is having multiple bank accounts in multiple banks. This interface integrates all existing banks and provides business solutions for both retail and corporate. This system acts as a standard interface between the clients and all the banks, By using this portal any client who maintain accounts in various banks can directly log on to Multi Banking System Interface and make any kind of transactions. In the backend, system will take care of the entire obligation required in order to carry on transaction smoothly. • Deriving Test Scenarios, Documenting Test Cases and Collecting Test Data for Functional Testing. • Creating Test Batches, Executing Test Cases and Reporting Defects. • Data Driven Testing with valid and invalid inputs, and Database Testing (Checking Data Integrity, Data Manipulations, and Data Comparison). • Tracking Defects, Selecting Test Cases for Re & Regression Testing. • Sanity Testing, Re & Regression Testing on modified Software Builds. • Collecting Test Metrics and Documentation. • Updating Test Cases and Test Data. • Tracking Changes, Preparing Reports and Updating Documents. • Team Communication and Customer Communication.